This simple and elegant design by DT member Vicki Romaine is the very epitome of Autumn beauty, don't you think? Simply beautiful. 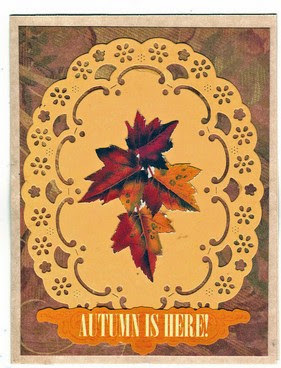 Vicki writes: "This Lunagirl grouping of leaves is the main feature on this card when placed on a Cheery Lynn Designs die. The sentiment is a SEI embellishment." Thank you, Vicki ~ Visit Vicki's blog cheerfulstamppad.blogspot.com and see her challenges too!